Following Stephen Paddock’s massacre in Las Vegas on Sunday night, there was, apparently, too little talk of terrorism. So little, in fact, that #terrorism trended nationwide on Twitter and most major news outlets published something exploring the nature and definition of the word. Within a day, rivers of digital ink had been spilled on the absence of the “terror” term in official and media descriptions of the attack and the white male attacker. It was an understandable, well-intentioned scramble to correct a racist double standard: Muslim killers are presumed terrorists, and white killers are accorded the benefit of lone-wolf status. Before the full body count was tallied, when next to nothing was known about 64-year-old gunman, the local Clark County Sheriff told press that he was not treating the shooting as a terrorist event: “No, not at this point,” he said. White House Press Secretary Sarah Huckabee Sanders echoed that “it would be premature to weigh in” on the terror question. It’s fair to guess that no such restraint and patience would have been applied had the killer been Muslim. 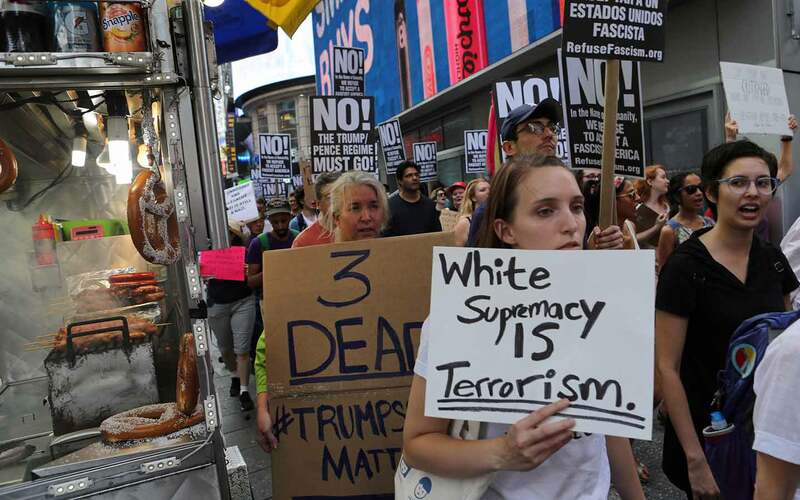 But the debate has fallen across a limited fulcrum wherein our options seem to be either maintaining a racist application of the terror label or demanding a broader application, which names white terror with equal readiness. The possibility of rejecting the terrorism label tout court is left off the table. This is a problem. The application of “terrorism” to white violence is not wrong, but it’s not useful, because the term “terrorism” is almost never useful—except, of course, if you’re the state. There is no neutral application of “terrorism” available such that all cases of violent crime with political or social objectives receive the label. Many ideology-drenched criminal acts that coerce and terrorize civilian populations don’t get deemed terrorism. If we wanted to truly equalize the term’s application, the violent targeting and caging of young black men by police would constitute a persistent terrorist threat. But we know, of course, that the state is exempt from the label, because the label is a state weapon. This is inherent to the meaning of terrorism in the United States, which has nothing to do with the presence of political objectives motivating a violent act per se, but everything to do with the state’s singling out its ideological enemies. By naming and reifying an enemy, the state has grounds to ramp up policing, surveillance, and other aspects of a repressive apparatus. “Counterterrorism” has been the framework of the last 16 years through which the US government has excused a whole manner of bellicose and oppressive acts. By labeling the terrorist, the state reveals its self-perceptions and narratives about who counts as a citizen and who a threat. This is an especially American fact, since “terror” has been designated the official state enemy. If there is anger that Donald Trump called the Vegas shooting “pure evil” but avoided the terror term (unlike with every knee-jerk tweet when the suspect has been Muslim), it is because in the American imaginary “terrorism” has come to mean something worse than “pure evil.” After horrors like Vegas, there’s a collective desire to label something “the worst.” But it’s a trick of state logic and protracted, formless war that we’ve come to conflate “terrorism” with “the worst.” If we believe “the worst” is synonymous with that which the state names its enemy, this suits a government seeking to expand its social control. The state’s enemies shift: In 2005, the FBI named so-called eco-terrorists “the nation’s top domestic terrorism threat,” despite the fact that since the introduction of the Animal Enterprise Terrorism Act in 2006, no single animal or human has been physically injured by eco-activists. The terror, according to state determinations, resided in property damage. Long before the War on Terror, terror designations fueled mass surveillance, militarization, entrapment, and victimization of vulnerable communities as well as those who would challenge state and corporate power. Under the guise of counterterrorism, the Black Panther Party was systematically destroyed by the FBI, its leaders murdered and its legacy in the civil-rights struggle besmirched. Since 9/11, presumed terror has been Muslim, and Muslim lives have been surveilled, persecuted, and extrajudicially punished. It’s understandable, then, that we would want the state to name and demonize terror perpetrated by a white man just as readily as it would any nonwhite presumed terrorist. If murderous racist acts deserving of the worst condemnation, like Dylann Roof’s massacre in Charleston, are not named terrorism, it’s because they are not terrorism. By which I mean, they are not considered a threat to America’s deep-rooted sensibilities, and they are not. This country is undergirded by white supremacy and white violence. This is a devastating historic problem, but not one solved by asking the state to name its own ideology as the enemy. To follow this approach to its logical conclusion, we would have to demand the state call itself a terrorist organization—perhaps a fair designation, but one which makes no sense, since it is the state that maintains the monopoly on who counts as its enemy. And this is the problem of invoking the terror label; it is an appeal to a state logic that needs challenging, not emboldening. After the Charlie Hebdo attacks in Paris, head of BBC Arabic Tarik Kafala said that the term “terrorist” should not be used to describe the gunmen. He explained that is “enough” to describe what happened in the attack, “we know what that means, we know what it is,” he said. In Las Vegas, one white man pointed a military-grade weapon at a crowd of thousands, exterminated 59, and injured hundreds. We need not call him a “lone wolf”—a term just as loaded as “terrorist” in its implication that attacks and attackers are isolated and anomalous. No descriptions or explanations of events like the Vegas massacre can nor should be free of politicization—that’s fine. But let’s seek specificity, context, and a language that speaks to the material conditions under which such nightmares become reality. A state rhetoric that would divide the world up into “us” and “them” will not serve and will never be applied justly.